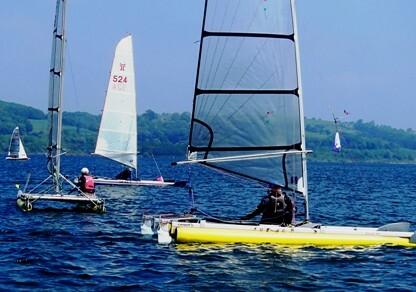 (Below) In light winds at Carsington 2013, the boats are slipping along smoothly, with Cliff (orange hulls) and Alastair (blue) watching the telltales and flag to respond quickly to shifts. Alastair demonstrates the strain of keeping a comfortable position well forward to do this, and Cliff has lain back on the trampoline, to see the indicators easily, with easy tiller control. 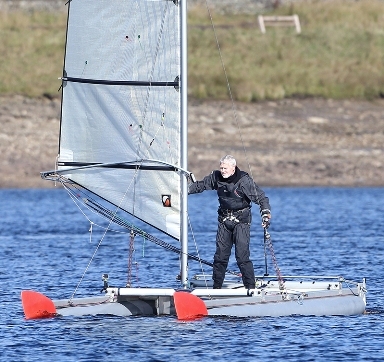 Running downwind, the outhaul is released, and the mast is fully rotated. It has its downsides---the tiller extension is less easy to control, and sudden puff or shift means a dive back down to a less vulnerable position. (Left) Alastair shaves past the spit at Bala, dead downwind. This forward position brings the transoms nicely out of the water, and the boat is slipping along well, as the wake and bow wave show. The position is good for getting a feel of the speed of the boat, and can be held without moving about, which would shake the flow of the gentle breeze. There is no view of the sail, and he did not have a vane on the forestay that day, so if the speed drops there is a delay looking up to the flag, and jolting about, to find the reason. However the run of the little waves ahead gives a good idea of wind direction. 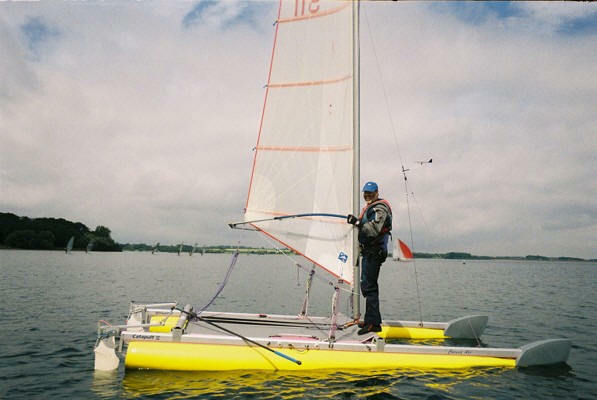 As with other light-wind sailing, getting into a familiar position in the boat lets the helm pick up the feel of the boat, and whether the speed feels right for the breeze. 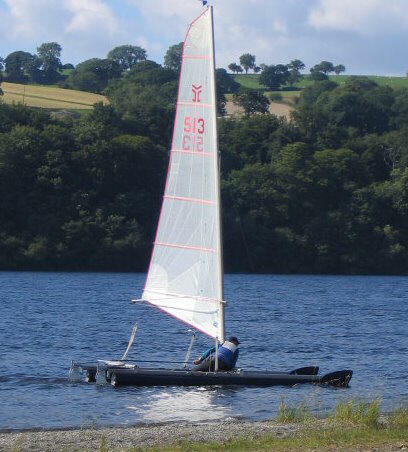 In drifting conditions at Rutland Water, Stuart takes this to extremes, and seems very happy and in control, although most sailors will want to keep some contact with the rudders!